Time of Origin: Varied; some come from Earth while others originate from outer space, but there have been recorded examples of various examples of werewolves from the 16th century to the future. Appearances: "Loups-Garoux", "The Sixth Doctor - The Last Adventure: The Red House", "The Greatest Show in the Galaxy", "Kursaal", "Wolfsbane", "Tooth and Claw". Doctors: Fourth Doctor, Fifth Doctor, Sixth Doctor, Seventh Doctor, Eighth Doctor and the Tenth Doctor. Companions:	Sarah Jane Smith, Harry Sullivan, Turlough, Charley Pollard, Ace, Samantha Jones and Rose Tyler. History: After confronting vampires on several occasions, it was only the logical step for The Doctor to be pitted up against werewolves as well. Another prominent monster from horror fiction, werewolves are either born with the affliction or created from the bite of another werewolf, cursed to transform into half-men/half-wolf monsters on the full moon (Although most stories have them transform on the days around the full moon itself as well), vulnerable only to silver weapons. Surprisingly enough for a science fiction series, only two of The Doctor's encounters with werewolves featured werewolves who definitively came from another planet; the other werewolves faced by The Doctor either originated from Earth or were left with their origins unspecified. The Doctor's first werewolf encounter technically occurred during his fourth and eighth incarnations simultaneously, when the Fourth Doctor's TARDIS 'accidentally' materialised (Although there are hints that it was drawn there by its disabled future self) in 1936 while responding to a distress signal sent by The Brigadier, resulting in The Doctor's companion Harry Sullivan being left behind when the TARDIS dematerialised once more. While in 1936, after discovering the dead body of a woman who had been apparently attacked by a werewolf, Harry befriended a man called The Doctor, little realising that the man in question was the amnesic Eighth Doctor, having lost all memory of his past, and, thus, totally failing to recognise Harry despite the time they'd spent together. While Harry stayed with the local aristocrats - Hester Stanton and her son George, Hester being a member of the Leffy family by birth -, nature in that area suddenly started acting strange as all the plants and trees in the area sprung into full bloom despite the fact that it was the end of November. Accompanied by Harry, The Doctor investigated the strange occurrences, discovering a young man named Godric from the past - specifically, from the era of none other than the actual King Arthur, who had been held prisoner by a dryad until the land 'woke up' again. As their investigations continued, Harry and The Doctor eventually learning that the werewolf in question was Emmeline Neuberger, a German cousin of Hester and George... but, as was discovered by closer inspection of the body, she hadn't killed the young woman the previous night; the bite marks were faked. Aided by Emmeline and Godric, The Doctor and Harry learned that Hester and George were convinced that they were the reincarnations of Mergan LeFay and Mordred, and intended to 'wake' the land up by having the werewolf Emmeline spill blood, allowing Hester to work her magic and turn the land against the people, essentially blackmailing Britain to make George king. Fortunately, Godric had discovered the Holy Grail shortly before he was captured by the dryad, which gave them a weapon to use against Hester; the presence of the Grail caused Emmeline pain due to her 'unnatural' nature, so The Doctor concluded that it would have an even more pronounced affect on a woman wielding the unnatural power Hester would be wielding as she attempted to turn nature against humanity. After Godric was injured and The Doctor knocked out after making contact with the Grail (Presumably due to his actions in "The Ancestor Cell" when he was forced to destroy his entire planet, albeit to save the universe), Harry took the Grail against Hester, sending her and the Grail falling into the Earth and leaving George a raving lunatic. Harry was subsequently picked up by the Fourth Doctor and Sarah, who also took Godric back to his own time, leaving the Eighth Doctor to unintentionally hand Emmeline over to a government organisation seeking to create werewolf soldiers for the upcoming war. Fortunately, the Fourth Doctor and Sarah Jane Smith (Having materialised about a month in the future while trying to get back to where they’d left Harry the first time) managed to rescue Emmeline from her captors, The Doctor subsequently using Emmeline's blood to put the land back to sleep once and for all before she returned to Germany to try and free her fellow werewolves. 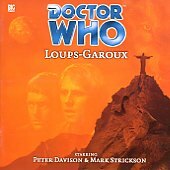 Some time after this, The Doctor encountered werewolves again during his fifth incarnation, when he and his companion Turlough visited Rio de Janeiro in 2080 to attend the Carnaval, despite the fact that the beaches by this point had become shantytowns for native Indians who had to relocate after the ecosystem collapsed and the Amazon became a desert. Investigating a hover-limo that instilled a strange sense of fear in the crowds, the two soon discovered that the limo belonged to the de Santos family, a family of werewolves whose head was the enigmatic Ilena de Santos. Noting a large grey wolf that was keeping up with the train despite the train going at over two hundred miles an hour, The Doctor went to warn Ilena, and learned of her werewolf nature, as well as her desire to escape the darkness of her curse. Learning that Ilena’s doctor was attempting to find a way to ‘cure’ the werewolf gene, and that Ilena herself was being stalked by a powerful werewolf called Pieter Stubbe, The Doctor challenged Stubbe, refusing to allow him to hurt any more people, but equally unwilling to be a party to the genocide of an ancient culture. As Stubbe returned to Rio to lead the werewolves in an attack, The Doctor confronted the werewolves about their dependence on Stubbe, and, in a confrontation with Stubbe himself, The Doctor tricked him into entering the TARDIS before taking it into orbit around Earth; this kind of werewolf was so tied to Earth that simply going too high would kill them as they lose contact with the planet. Saying goodbye to Ilena, The Doctor and Turlough departed, confident that their new friends and allies would manage to find peace. The Doctor's next couple of encounters with werewolves, however, were less straightforward than his earlier ones; for one thing, neither of these encounters were with werewolves who originated from Earth, but were alien species who shared many features with the werewolves of Earth. A particularly ununusual one occurred when the Sixth Doctor and the time-displaced Charley Pollard visited an unspecified Earth colony that had originally been inhabited by dog-like aliens who had 'infected' some of the human colonists with a disease that turned them into wolf-like creatures at the end of the planet's eight-day lunar cycle ("The Red House"). The colonists initially dealt with this by shipping the infected to an island as a kind of leper colony, but over the next two centuries the breeding population changed so that their wolf state was their 'dominant' form, with the ironic result that their wolf sides were now tame while they mutated into feral proto-humans during the daylight. Fascinated by the wolves, Doctor Paignton attempted to use her 'psychic extractor' technology to remove the more feral impulses from the island's inhabitants so that the main colony wouldn't destroy the wolves out of fear, but some of the wolves saw this as destroying their culture and refused to participate in the project. When The Doctor and Charley arrived, Charley was taken to the Red House where Paignton conducted her experiments when she was mistaken for a feral wolf while The Doctor met some of those opposed to Paignton's plan, with The Doctor thus getting a perspective that presented the wolves as an oppressed minority, while Charley received a more detailed story from a man who presented himself as a Time Lord agent. Although The Doctor helped the wolves gain access to the Red House and rescue Charley, things nearly went wrong when one of the wolves attempted to force the mainland to send a plane to the island so that the wolves could travel back and infect the other colonists, only for the mainland to launch a missile at the island instead. Fortunately, a time-field set up by the other Time Lord - later identified by The Doctor as his own dark future, The Valeyard, who stole the extractor as part of a larger scheme - immobilised the missile in the air long enough that it exploded away from the island, allowing The Doctor and Charley to help the islanders flee for another part of the planet and fake their deaths. During a later trip to the self-proclaimed 'Greatest Show in the Galaxy' after receiving an advertisement on the TARDIS monitor, the Seventh Doctor and Ace encountered a woman called Mags, who was either a human werewolf or a werewolf-like alien (Which one of these was the case was not unspecified) who was being forced to serve a space explorer known simply as the Captain. With The Doctor and Ace trapped in the Psychic Circus - really an elaborate show created by the ‘Gods of Ragnarok’ to entertain themselves - the Captain, seeking to control the power of the gods himself, triggered Mags’ wolf transformation via artificial moonlight. The Captain intended to use Mags to entertain the gods and allow himself to make a deal with them for more power, but Mags turned on the Captain and killed him after The Doctor convinced her to resist her feral instincts. With the Circus and the Gods of Ragnarok destroyed, Mags and Kingpin - the head of the original circus, and the only other survivor - decided to start a new circus for themselves, although The Doctor declined the offer to join them. During his Eighth incarnation, The Doctor and his new companion Samantha Jones encountered a different kind of werewolf during the events of "Kursaal", when they found themselves on the planet Saturnia Regina prior to its conversion into the Kursaal theme park; they’d been aiming for the park itself, but arrived five years too early. Discovering that a wolf-like species known as the Jax, long thought extinct, lived under the site of the proposed attractions, and were attacking the humans there and transforming them into wolf-like creatures. During the course of his investigation, The Doctor learned that Jax were not the wolves, but the virus that caused the transformation itself, controlled by ancient Jax technology contained within their cathedral. Sam was briefly injected by the Jax ‘virus’, almost causing her to transform into the new Jax leader, but The Doctor, refusing to kill his companion, managed to knock her out by tricking her into thinking she was exposed to moonlight when it was only an illusion. Fortunately, the Jax technology was destroyed in a shuttle crash when The Doctor was forced to flee in an escape pod due to damage to the shuttle, and, with the loss of the Jax technology, Sam’s infection was cured. The Doctor's last encounter with werewolves occurred in his tenth incarnation, during a visit to 1879 after The Doctor's attempts to take Rose Tyler to a concert in 1979 failed when he missed the target date. Joining Queen Victoria on a trip to the Torchwood Estate, The Doctor learned from Sir Robert, the owner of the Estate, of a local legend of a werewolf that haunted the glens, having started after a meteor fell to Earth almost three hundred years ago, and was hidden by a group of monks who turned from God to worship the wolf. In this case, lycanthropy was described as being very like an ‘infection’, with a young boy being abducted from his home every generation and bitten to ensure the wolf’s survival, with The monks now planning to 'infect' Victoria with the wolf's bite, thus creating the 'Empire of the Wolf' and totally changing human history. Fortunately, although The monks prevented anyone from leaving the house, The Doctor managed to get Rose, Victoria and Sir Robert to the library, which had walls coated with mistletoe to keep the wolf at bay (Whether the wolf actually had a problem with mistletoe or The monks had just trained it that way to control it was unclear). Aided by the books in Sir Robert's father's library, The Doctor realised that Sir Robert’s father, aided by Prince Albert, had set up an elaborate plan to kill the wolf using Sir Robert’s father’s personally-designed telescope in the attic, and the Koh-i-Noor, one of the world’s largest diamonds. By channelling the moonlight through the telescope via the diamond, The Doctor was able to ‘overfeed’ the wolf with moonlight; much like humans need water but can still drown, too much moonlight destroyed the wolf once and for all (Although evidence suggests that the ‘infection’ may have been passed on to the royal family, this is speculation at best).